Just when you thought business magnate and evironmentalist Richard Branson couldn't get any more loveable, he goes and opens a spectacular eco camp in Kenya. The Mahali Mzuri Eco Camp is a luxury safari retreat set in the Motorogi Conservancy within the Maasai Mara ecosystem. The camp's compact design manages to meet all the needs of the luxury safari seeker, but with minimal impact to the local environment. Completed in 2013, the Mahali Mzuri lodge is the result of a strong collaboration between Richard Branson's Virgin Limited Edition properties and the local Maasai community. The camp is located on the northern boundary of the Maasai Mara reserve, which was once divided into individual freehold titles among local Maasai families. However, due to the location and size of the plots, they were not considered economically viable on an individual basis. In order for the land owners to benefit from their properties and prevent the fragmentation of the historical and environmental resource, a conservancy of contiguous parcels was created. According to operations manager, Liam Breedveld, the road to creating the Motorogi Conservancy took several years of negotiating between 277 local Maasai families. “People started fencing off the land, using it for ranching and charcoal production, potentially disrupting the entire ecosystem. The wildlife couldn’t roam, the cattle couldn’t graze and the entire Maasai culture came under threat.” The agreement to combine the plots into an economical resource under the Conservancy terms was made with the stipulation that the Massai will forever have an undeniable right to continue their traditional cattle grazing patterns in the area, something absolutely fundamental to the community’s survival. The camp’s name, Mahali Mzuri, means ‘beautiful place’ in Swahili, but for those lucky enough to visit the camp (almost $600.00 per night), the blissful lodgings seem even more magical than its translated name would indicate. The compact camp has just 12 luxury tent suites that cater to a maximum of 24 guests at any one time in order to reduce the operation’s footprint. Lucky guests can view the grazing wildlife from a 40 foot infinity pool and take advantage of the daily safari drives and walks into the bush led by local Maasai guides. 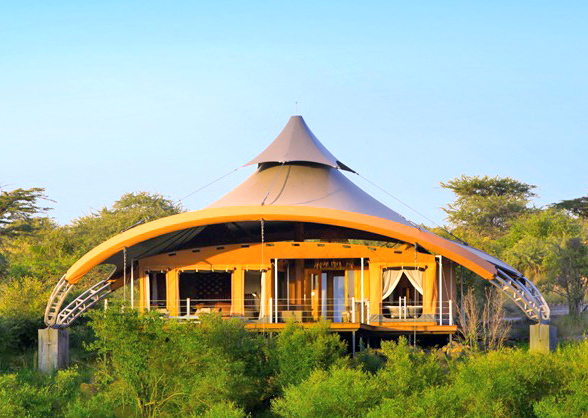 By offering a small number of tents to a limited number of people, and emphasizing eco-friendly practices on a daily basis to the guests, the Mahali Mzuri eco-camp project is a perfect example of how tourism can benefit local communities without negatively impacting the local environment. From the beginning, the key priority for the project was to provide safari goers with luxurious accommodation for safari adventures, but at minimal environmental costs to the Maasai communities. By encouraging a working collaboration between Mr. Branson and the Massai, the incredible project serves as a stellar example of how low density tourism can coexist with nature without disturbing it. Wonderful! Congrats for having a base in Kenya. The camp is located on the northern boundary of the Maasai Mara reserve, which was once divided into individual freehold titles among the locals. Richard Branson witth one local Massai tribe members. Due to the location and size of the plots, the individually-owned plots were not considered economically viable. Mahali Mzuri means ‘beautiful place’ in Swahili, but for those lucky enough to visit the camp (almost $600.00 per night), the blissfull camp seems even more magical than it's translated name would indicate. The compact camp has just 12 luxury tented suites that cater to a maximum of 24 guests at any one time in order to reduce the operation's footprint. Lucky guests can view the grazing wildlife from a 40 foot infinity pool and take advantage of the daily safari drives and walks into the bush led by local Maasai guides. By offering a small number of tents to a limited number of people, and emphasizing eco-friendly practices on a daily basis to the guests, the Mahali Mzuri eco-camp project is a perfect example of how tourism can benefit local communities without negatively impacting the local environment. From the beginning, the key priority for the project was to provide safari goers with luxurious accommodation, but at minimal environmental cost to the Maasai communities. By encouraging a working collaboration between Mr. Branson and the Massai, the incredible project serves as a stellar example of how low density tourism can coexist with nature without disturbing it. The Mahali Mzuri camp demonstrates that environmental conservation and tourism can work side by side. 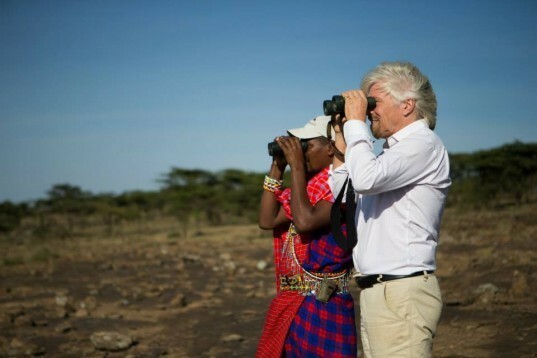 Richard Branson enjoying a safari watch with a local Maasai guide. Guest of the Mahali Mzuir can enjoy two safari rides and walks a day with local Maasai guides.